Ricki and the Flash is a 2015 American comedy-drama film directed by Jonathan Demme and written by Diablo Cody, about a woman who leaves her family to become a rock star and later gets a chance to make amends. The film stars Meryl Streep, Mamie Gummer, Kevin Kline, Sebastian Stan, Rick Springfield, Audra McDonald, and Ben Platt. The film marks Streep and Kline's third collaboration after Sophie's Choice (1982) and A Prairie Home Companion (2006). It was Demme's final dramatic film before his death in April 2017. Principal photography began on October 13, 2014, in Rye, New York. TriStar Pictures financed, and released the film on August 7, 2015. The film received mixed reviews from critics who praised the performances of the cast but criticised its screenplay, tone and execution and grossed $41.3 million at the box office against its $30 million budget. Ricki chased her dreams of becoming a famous rock star by abandoning her family. She gets a chance to put things right when her ex-husband Pete asks her to visit Indianapolis and help their estranged daughter Julie through a difficult time. 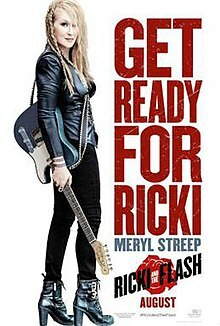 Ricki has a rock band that plays a regular gig at a small bar, when she is not working as a cashier to make ends meet. Julie recently attempted suicide because her husband cheated on her and is divorcing her. Despite being broke, Ricki comes to Indianapolis to help her daughter, but Julie is hostile. Likewise, her two sons are hostile and unwelcoming. One is gay and the other recently became engaged, though no one told their mother. Still, Ricki gets through to Julie. Unfortunately, her husband's second wife, Maureen, returns unexpectedly, confronting Ricki with some hard truths. She wasn't there for her children when they needed her and Maureen was. Ashamed, Ricki returns to her band in California angry and bitter, insulting her guitarist who is in love with her. He makes her realize he cares and they make love. Maureen sends Ricki an invitation to the son's wedding as an olive branch, but Ricki can't afford to go. Her boyfriend sells his best guitar to pay for the tickets. Despite her attempts at reconciliation, she's clearly still an outsider. The wedding guests look askance at Ricki when she gets up to toast the bride and groom. As her gift, having no money, she has her band take over and play for the guests. Her son and his bride start the wedding dance and slowly the guests join in. Diablo Cody based the script in part on her mother-in-law Terry Cieri, who has fronted a New Jersey bar band for years. Cody said, "I watched her on stage so many times, and I thought to myself, 'This woman's life is a movie.'" Cody specifically wrote the role of Ricki with Streep in her mind noting that actresses over 50 in Hollywood typically don't get complicated parts. Streep's costar is played by her real life daughter, Mamie Gummer  marking the third film the two have made together, after 1986's Heartburn and 2007's Evening." Ricki and the Flash was dedicated to "Rick the Bass Player", which is the stage name for Rick Rosas who played "Buster", the Flash's bass player in the film. Filming was first set to begin on October 1, 2014 in New York City. Principal photography officially began on October 13, 2014, in Rye, New York. On October 14, Streep was spotted filming some scenes at Numi & Co. Hair Salon in Rye. On November 3, 2014, she was also seen filming in Nyack, New York. The wedding sequence was shot at Untermyer Park in Yonkers, New York. On May 6, 2014, Sony's TriStar set the film for a June 26, 2015 release. The release date was later changed to August 7, 2015. The film was chosen as the opening selection for the 2015 Locarno Film Festival which was held on August 5, 2015 in Locarno, Switzerland. Ricki and the Flash grossed $26.8 million in North America and $13.3 million in other territories for a worldwide total of $40.1 million, against a budget of $18 million. The film grossed $6.6 million from 1,603 theaters in its opening weekend, finishing 7th at the box office. The film added 461 theaters in its second week (a total of 2,064 screens), but dropped to ninth place with $4.6 million (a decline of 31 percent). In its third week the film grossed $3 million from 2,013 screens. The film opened in Italy on September 11, 2015 and came in fifth place with a weekend total of $413,800. Ricki and the Flash has received mixed reviews from critics. On the review aggregator website Rotten Tomatoes, the film holds a rating of 64%, based on 160 reviews, with an average rating of 6/10. The site's critical consensus reads, "Meryl Streep's outstanding work helps Ricki and the Flash overcome its inconsistent tone and fairly-predictable premise." Metacritic gives the film a score of 54 out of 100, based on reviews from 36 critics, indicating "mixed or average reviews". CinemaScore announced that audiences gave the film an average grade of "B" on an A+ to F scale. IGN gave the film a score of 7.8/10, saying, "Ricki and the Flash offers a breezy, heartwarming, if somewhat manufactured tale about an aging rocker reconnecting with her family". ^ Sneider, Jeff (June 17, 2014). "Kevin Kline, Mamie Gummer in Negotiations to Join Meryl Streep in 'Ricki and the Flash' (Exclusive)". TheWrap. Retrieved October 16, 2018. ^ "Ricki and the Flash (2015) - Financial Information". The Numbers. Retrieved October 16, 2018. ^ "RICKI AND THE FLASH (PG)". British Board of Film Classification. August 7, 2015. Retrieved August 7, 2015. ^ FilmL.A. (June 15, 2016). "2015 Feature Film Study". Archived from the original on July 4, 2016. Retrieved June 16, 2016. ^ a b "Ricki and the Flash (2015)". Box Office Mojo. Retrieved June 16, 2016. ^ Biese, Alex (July 24, 2015). "Meryl Streep plays Toms River mom in new film". Asbury Park Press. Retrieved July 29, 2015. ^ Miller, Julie (August 5, 2015). "Meet the Woman Who Inspired Meryl Streep's Ricki and the Flash Character". Vanity Fair. Retrieved September 11, 2015. ^ a b c d Abramovitch, Seth (August 1, 2014). "Meryl Streep Learning Guitar for Diablo Cody Movie". The Hollywood Reporter. Retrieved October 17, 2014. ^ Sneider, Jeff (June 17, 2014). "Kevin Kline, Mamie Gummer in Negotiations to Join Meryl Streep in 'Ricki and the Flash'". TheWrap. Retrieved October 17, 2014. ^ "Meryl Streep filming 'Ricki and the Flash' in Rye, NY". onlocationvacations.com. October 15, 2014. Retrieved October 17, 2014. ^ Muchnick, Jeanne (October 16, 2014). "Meryl Streep Films Movie At Rye's Numi Hair Salon". The White Plains Daily Voice. Retrieved October 17, 2014. ^ "TriStar Productions Dates Its First Two Films for 2015". ComingSoon.net. May 6, 2014. Retrieved October 17, 2014. ^ "Meryl Streep Musical Dramedy 'Ricki And The Flash' To Open Locarno Film Festival". Deadline Hollywood. May 6, 2014. Retrieved July 17, 2015. ^ "Ricki and the Flash". Rotten Tomatoes. Retrieved November 29, 2015. ^ "Ricki and the Flash". Metacritic. CBS Interactive. Retrieved August 7, 2015. ^ "'Mission: Impossible' Beats 'Fantastic Four'; 'The Gift' Unwraps $11.8M, 'Ricki And The Flash,' 'Shaun The Sheep' Results — Box Office Final". Deadline Hollywood. Retrieved August 8, 2015. ^ "Ricki and the Flash Review - IGN". Uk.ign.com. August 6, 2015. Retrieved February 9, 2018. This page was last edited on 22 February 2019, at 19:30 (UTC).